Catholic News World : #BreakingNews Thousands Join in Coast to Coast Rosary in the USA and Canada for the World! #BreakingNews Thousands Join in Coast to Coast Rosary in the USA and Canada for the World! On Sunday, October 7, thousands of people joined together to pray the rosary in the US and Canada. If you missed this event - you can still join in the prayer of the rosary no matter where you are in the world! In 2013 the USCCB launched a Call to Prayer for Life, Marriage and Religious Liberty. The intent of this Call to Prayer is to invite Catholics in their parishes and dioceses to pray and make daily sacrifices to rebuild a culture favourable to life and marriage and for increased protection of religious liberty. Archbishop Salvatore Cordileone of San Francisco stated: “With the challenges this country is facing, it is hoped this call to prayer and penance will help build awareness among the faithful as well as spiritual stamina and courage for effective witness.” The Novena for Our Nation and National Rosary Rally have been acting upon that Call from our Bishops for the past two years and again in 2018; taking it to a national level. Now Rosary Coast to Coast invites Catholics to join together in praying together for these intentions at the same time on the October 7 Feast of Our Lady of the Rosary. Rosary Coast to Coast builds upon the 54 day Rosary Novena for Our Nation in which tens of thousands of prayer warriors joined together in 2016 and 2017 to pray for: a respect for life at all stages of development; the sanctity of marriage and family; and freedom of religion and protection from religious persecution. 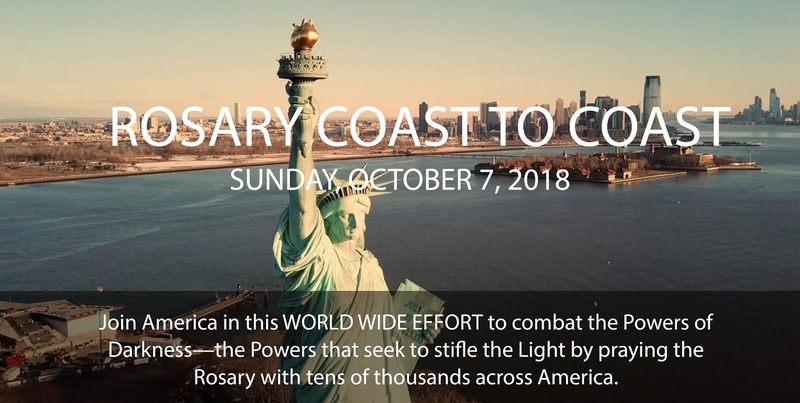 Rosary Coast to Coast also builds upon the National Rosary Rally held the past 2 years in front of the US Capitol on the October 7 Feast of Our Lady of the Rosary to conclude the Novena for Our Nation. The National Rosary Rally features prominent Catholic clergy and lay people as speakers leading us through all four mysteries of the Rosary.“I bear a special love for Poland, and if she will be obedient to My will, I will exalt her in might and holiness. From her will come forth the spark that will prepare the world for My final coming” — Jesus to St Faustina Kowalska (Diary, 1732). In 2017, the Church in Poland gathered around the borders of their country to light a spiritual flame, a flame that quickly engulfed the nation in prayer and reparation. Shortly after, the sparks from this conflagration of the Holy Spirit spread, to Ireland, the British Isles and now, the United States. This is a WORLD WIDE EFFORT to combat the Powers of Darkness—the Powers that seek to stifle the Light.